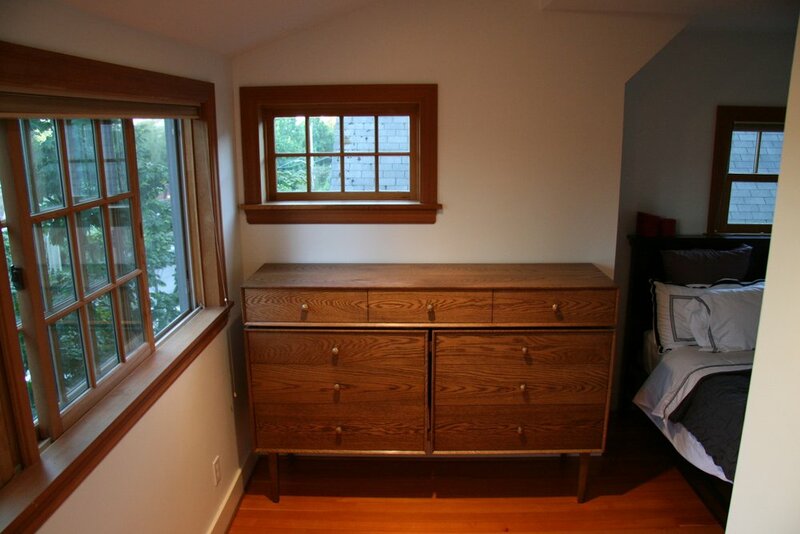 Kathleen came to me with a very typically-Seattle problem: how can I get big, beautiful furniture up the tiny winding staircase of my old craftsman house? After measuring and talking and measuring some more, I came up with this innovative solution: A large, three-piece cabinet that bolts together to create one integral piece. This was my toughest build to date, with lots of interesting features: all the wood for the top and sides comes from one giant plank of white oak. This monster board was split down the middle and bookmatched to create seamless, flowing, wraparound ground. All twelve corners are mitered to maximize this wraparound effect. A beveled front gives a classic mid-century-modern look to the piece, and seamless grain across all the drawer fronts again highlight the natural beauty of oak. Plus, I installed luxury self-closing drawer slides!